Have you ever found yourself wishing that you could play an instrument? Or rueing the day that you quit piano lessons as a kid? I’ve heard too many people say that they are too old to learn music. While you might not find yourself traveling the world as a concert soloist, it is absolutely NOT true that adults cannot enjoy learning to play musical instruments. It’s good for your brain. You see neuroplasticity at work as you build new networks among your brain cells. It’s good for your body. Depending on what instrument you choose, you can keep your hands limber, your core strong, and your lungs in good working order. It’s something you can enjoy with others. You can join a band, sit in on a jam session, or play around with your family and friends. It’s something you can enjoy alone. Playing music beats TV when you’re not up for socializing. It’s a great springboard for creativity. You can use your new musical skills as inspiration for songwriting, composition, or video projects. …and you’re better equipped to enjoy it now anyway. You have more patience now, and definitely a better attention span than a kid. You have better coordination now, which makes it easier to learn some technical skills. You can value the process of learning over the product of performance. No worries about scholarships or contests. You don’t ever have to perform if you don’t want to. You understand the value of practice. You’ve chosen to invest your time and money, and you know it’s worth it. You can choose the music you like and want to learn. You know what you like and how to ask for help playing it. Sure, you might not become a rich and famous musician starting out later in life, but there is no reason why you can’t enjoy making music for years to come. Interested in learning an instrument? If you’re in the Kansas City area, I’d love to help you on this journey. Read more here then contact me to schedule your first lesson. 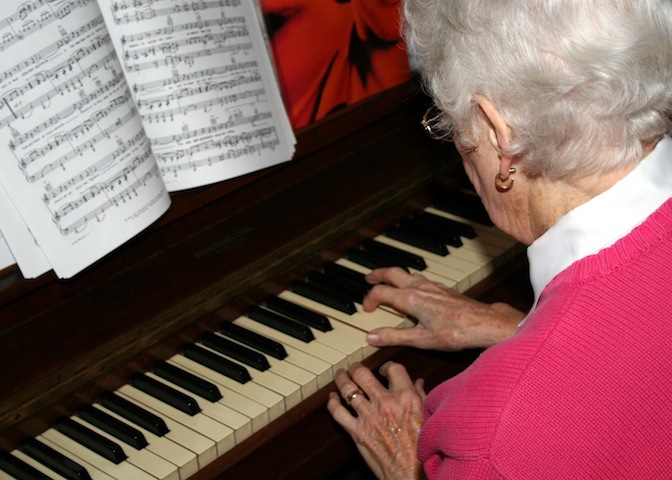 Eldercare professionals: Looking for tips and ideas for helping seniors play the music they love? Be sure to check out Soundscaping Source, our site especially for you. i completely agree. I started from scratch at the age of 30. Very interesting Rachelle. Music is very rewarding indeed.